Greg Holden talks plugging into St. Pete's business community, making waves, and leaving the world a better place. On this episode of SPx, we sit down with past St. Pete Chamber Board Chair and VP of Manning and Napier, Greg Holden. A native of Ohio, Holden has earned deep roots in the St. Pete community through his tireless work to help rebuild the Chamber, and through his involvement in programs such as St Pete Young Professionals and Leadership St. Pete. 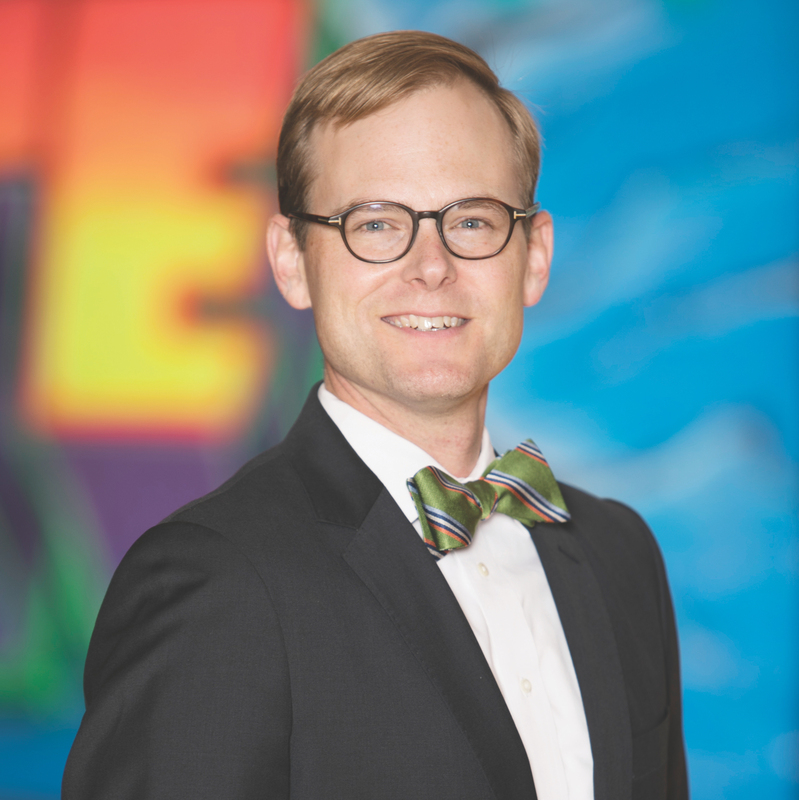 Alongside his wave-making Leadership St. Pete cohort, in 2016, Holden became the second youngest Board Chair in St. Pete history. Holden talks the welcoming aura of St. Pete, making connections - and change - in the city he's made his home, and his efforts to give back. Holden grew up in Ohio and met his wife, Mollie, at Summer Camp in North Carolina. Camps have had a major impact on his life, and he continues to work with and support them into adulthood. The Holdens moved to St. Pete in 2007. Greg says he moved in a bit blindly, "I think that the primary reason that I moved to Florida was that Mollie asked me to move to Florida in December, in Ohio. I really knew very little about Florida." In 2007, St. Pete was at the early part of it's current renaissance. Greg and Mollie "moved down and just fell in love with St. Pete. We were coming over and going to the Saturday morning market, we were going to Fort DeSoto and hitting all of the highlights and all of the stuff that everybody raves about." "Through the 1980s and the '70s, [St. Pete] was kind of sleepy, and that was the general perception. And so I think that's really what in many ways I believe teed up the renaissance and set the stage for the 2000s, and the period through leadership in the city and the Chamber and otherwise they took St. Petersburg to the next level, that allowed the raw land at prices that worked, to work with property owners to create Beach Drive, to have Central Ave redevelop organically with independently owned businesses." The road to success in St. Pete has not always been smooth, says Holden, "I moved down feeling very confident, I lost that confidence quickly. And it was about a year into moving here that I was let go. And so that was a shaping experience for me, having just bought a house here in Florida and living through that, looking back it was a fortuitous time for me in the way I was able to take advantage of that, but it was a really scary time, and so a very personal experience for me in the downturn." Despite being let go during the recession, Holden didn't lose his drive. He participated in Leadership St. Pete anyway and put his full effort into it. "I credit that moment as a lot of what set me on the path I am today, because Leadership St. Pete built a lot of the foundation for my involvement in the community, and built a lot of the relationships that I still cherish today and benefit from today in being connected. And I'll tell you, as stressful as it was, my job search was meeting people. And so I may hold the record for having the most coffees with fellow class members since I've made that my full time job." He says of Leadership St. Pete: "It's just really interesting the kind of relationships that you build in settings like that. It's shared experience and it is very rare that you can get a group of people that's that high performing to commit to spend that much time together." Of his 20's, Holden says, "I had gotten good advice and good mentorship, and said, 'You know? In my late 20s, before I'm married, before I have kids, before my career is gonna hopefully get bigger and busier every year, I'm gonna show up everywhere and I'm gonna contribute, and I'm gonna say yes, I'm gonna take Bob Devin Jones's advice and I'm just gonna say 'yes.'" During Holden's tenure at the Chamber, as the second youngest chair in history, he helped to birth an annual benchmarking trip, "It was a trip that we started in 2016 and set it up in a way that it would become an annual tradition of thinking outside the Burg. And so much like Leadership St. Pete, we've built a good program and that we knew people would bring value away from, but it was as much about the relationships that you build after dinner drinks together with someone, as it was about the actual curriculum." The next trip will travel to Columbus, Ohio, a city facing very similar challenges as St. Pete. "When I think about the next big thing, I believe that in the next ten years St. Pete is going to decide, and hopefully decide for ourselves rather than someone else labeling us... and I think St. Pete's gonna determine whether we are a city or a suburb." On the Rowdies #MLS2STPETE: "I think there will be two teams likely to be announced by the end of this year, and I think that we don't expect to be in the top two, given some of the dynamics of the other teams, but we feel very good about our positioning and our chances for those second two slots." "The Rowdies brand is actually better known in European soccer parlance and communities than it is in the U.S. in many ways. So I think the idea of continuing along the lines of the Dali Museum, the Leadership Institute at Eckerd College, some of these institutions we have that really have international reach that bring people here from international locales." On Grow Smarter Initiative: "At the Chamber we talk about Grow Smarter, because we don't wanna grow the fastest, we don't wanna grow the biggest, but we wanna grow smarter. Growth is good, but we wanna be smart and thoughtful about that growth, and we certainly don't want to leave anybody behind." Holden's next move? The Board of the St. Pete Free Clinic. "It's been ultimately rewarding to be involved in the Chamber and I will continue to be involved there, but I do feel called to be a little more deliberate about trying to find ways to help those who can't help themselves, or those who need some help to get themselves back on their feet." "I think that I learned early on that I always wanted to leave things better than I found them, and I've had great examples along the way in that, and so even in Columbus I was involved in young professional programs and helped to launch some of those, and I knew coming to Florida that the Chamber, the Young Professionals programs were gonna be how I was going to connect and plug in as a 20-something. So I did. I'm proud of having joined the Chamber before moving here, and being a part of Young Professionals was really what helped to get me connected. I made some of the closest friends that I have today." "Being able to be part of the rebirth of the Chamber earned me a lot of credibility with the other board members. But 'earned' is the right word, because I showed up, and I've contributed, and I've put up in there a lot of long hours, and there were a lot of big asks, and I've never been afraid to think big or make a big ask." Ashley: Hi there. Today I’m here with our special guest, Greg Holden. Greg, thank you for joining us today. Greg: It’s great to be here. Ashley: So this is cool. I am happy to have this opportunity to spend this time with you. I’m not a native of St. Pete, you’re not a native of St. Pete and I want to learn more about that. But I will tell you that you are quintessential to St. Pete for those that don’t know you, and I assume that many of our listeners do. And I would love to take some time to get to know a little bit about how you came to St. Pete and how Greg Holden, the man of St. Pete, all got started. Greg: It is my goal for people to think that I am from St. Petersburg. But you’re right, I did chase by now-wife here to arrive. Ashley: It was all a girl. It was a girl that got you here. Greg: It was all about a girl, right. Ashley: Now, where were you? You were born in Atlanta and then you went to school in Ohio? Ashley: Okay. And so this is where you were before moving to St. Petersburg? Greg: Was in Ohio, did ten years of time there. Ashley: And you were working for a financial firm at that point? Greg: I did. I started my career financing non-profits. So I was a liberal arts major in school, but came out to a public finance investment banking firm, did a lot of work in healthcare, senior living, a lot of economic development work. And the level of what I was doing, it was geographically undesirable, because it was all focused on Ohio. And there are a lot of great things about Ohio, but there’s no St. Petersburg in Ohio. Ashley: So you spent most of your young years in South Carolina, North Carolina. How did you end up in school in Ohio? Greg: All of my dad’s job. It sounds like the military, but it was banking in the ’80s. So he was a community banker and he was very involved in his community, all the way through. So come by it naturally and honestly, but it’s that old community bank mantra, and through those years where community banks were all getting bought up and acquired. So that was really what led us moving around. Ashley: So you met your now-wife in Ohio? Greg: I met my now-wife as a summer camp counselor on the coast of North Carolina. Ashley: You need to tell us more about this. Because you’re still involved, aren’t you? In the summer camp realm. Greg: I am, one of the largest summer camps in the country, Camp Sea Gull and Seafarer on the Crystal Coast, North Carolina. YMCA camps, in fact, and great places. My favorite memories as a kid were going to family camp, we would drive from Winston-Salem out there, and at that time you would park your car and there was no work, there were no cellphones, there was no phone, there was no computer and the camp made the food, and so you’ve got to see your parents take their suit off, or take off their work clothes and just play. And so they are the best memories I’ve got ever as a kid, and so I stayed in touch with the camps, I worked there. And the true story that is probably worth telling is that I met Mollie at the boys’ camp. So there’s a girls’ camp and a boys’ camp. Boys’ camps are all large, about 800 campers and about 400 counselors, and they keep a couple of girls on staff working headquarters to prevent a Lord of the Flies type scenario from taking hold. So by the end of the summer every guy was very good friends with Mollie, but I was the one who kept calling after the camp. Ashley: And so when you move beyond your own experiences with your family in that environment, and now you’re a facilitator of that environment, or you’re still involved in some capacity today, what do you get from that experience now? Is it just the transfer of those experiences that you once enjoyed and making sure that is perpetuated through the years? When you talk about turning off cell phones and moving away from the machine, now more than ever it feels like it’s almost a lost art. Greg: It is absolutely a lost art. So I’m in my 6th year of board service for camp Sea Gull and Seafarer, so this is the final year for me. And it’s been unbelievably rewarding, and I think when I went to the camp– these camps have been around 50 or 60 years, and frankly had a reputation for a long time of being rich kid camps, and that’s just because going to camp for four weeks is expensive. And I’m really proud of what we’ve done over the last ten years, and particularly in the last six years, to improve the diversity of the camps. I think it’s important for the kids that attend to get that experience, it’s important to give that experience to kids that don’t come from a country club background at home, that have different backgrounds, an inner-city background, or a rural background, or just have never been on the water. These camps sit on the Neuse River, and so they’re big sailing/motorboating camps. And so being able to help provide that kind of character development with the YMCA’s focus and core principles there is really important to me, and it’s been really rewarding to see camp change kids’ lives. And it is hard to keep the kids away from technology, it’s a constant battle that’s been almost comical at times. The most extreme story that we have experienced in the last couple of years is there is a no cell phone policy for campers, there is an expectation that the counsellors will use their cell phones on their time off, so that there are no cell phones in front of the kids. You’re there, you’re focused in the moment on what you’re doing, and building the relationships there. But kids do get around that, and sometimes their parents aid and abet them in that so much so that we had a camper who brought his cell phone to camp, had that cell phone taken from them, then had a backup cell phone hidden in their foot locker they then used to order a refrigerator for their cabin on Amazon Prime, and Amazon Prime delivered the fridge to camp. It never made it to the cabin, but that’s probably the most extreme story of these kids, and so obviously you’ve got kids that come from very affluent backgrounds, and others that come from not affluent background, and so it’s a great melting pot of kids. And amazingly for a YMCA camp the second session is over a half Jewish. So it’s a really interesting, it’s international focus, but really built around character development and seamanship. Ashley: Well, that’s amazing. So the contraband phone and the Amazon order, I don’t know if I’ve ever– part of that type of illegal activity happening in the camp site. But it sounds like the earlier part of your career was– I don’t wanna say it was mapped out, but it seems like there was an internal compass in terms of where you thought you might end up. And maybe much to your surprise you ended up in Florida, obviously you had great motivation to move here. I’m curious what your perceptions were of Florida, and so arriving to St. Pete, how much of that was confirmed, and how much of that was a complete surprise to you? Greg: I think that the primary reason that I moved to Florida was that Mollie asked me to move to Florida in December, in Ohio. I really knew very little about Florida. I was pretty confident that I did not want to stay in Ohio. I’ve got great friends in Ohio and I love visiting Ohio, but I knew I didn’t want to stay in Ohio and I knew I didn’t want to move Mollie to Ohio and then ask her to leave. But I pretty much knew the basics of Florida. Panama City Spring Break in the ’90s, Walt Disney World and trailer parks. And that was about the extent of my knowledge. And obviously now living here, having been through Leadership St. Pete, Leadership Florida, and really knowing the state, it’s comical to look back at that perspective. But I didn’t come kicking and screaming, but I came with very low expectations, and it was a time in my life when I was totally open to a new adventure and fun to give it shot, but I had no idea what I had in store. And certainly, I think my timing was really fortuitous. We started in Tampa at Rocky Point, we lived close to everything, yet close to nothing. Ashley: What year was this? Greg: So August 2007 moved down and just fell in love with St. Pete. We were coming over and going to the Saturday Morning Market, we were at Fort DeSoto and hitting all of the highlights and all of the stuff that everybody raves about, and it was not the very beginning of renaissance, but certainly on the early end of it. Ashley: Well we were in a great recession at that point. You’re moving into 2008 and the years that follow, so I’m wondering what your perception of the city was from that time? Greg: I think that… So St. Pete has certainly felt the brunt of the real estate downturn. I actually think that one of the real benefits of St. Petersburg over the last ten years has been that we did not have major success in the decades preceding that, right? So we’ve had some great periods in our history, but we didn’t tear everything down and build a lot of ’80s developments, right? Through the 1980s and the ’70s, and so really it was kind of sleepy, and that was the general perception. And so I think that’s really what in many ways I believe teed up the renaissance and set the stage for the 2000s, and the period through leadership in the city and the Chamber and otherwise they took St. Petersburg to the next level, that allowed the raw land at prices that worked, to work with property owners to create Beach Drive, to have Central redevelop organically with independently owned businesses. So I think that was a lot of the landscape in the city. For me personally it was an interesting time, so I came down here feeling very confident that I had transferable skills, that I could anywhere, and so I was gonna chase this girl and make a go of it in Florida. And I changed jobs, because the job that I had was very economic development oriented, doing financing and incentives for economic development in Ohio and throughout the MidWest. And so I made a change and was working in public finance and investment banking, focused on private schools, charter schools, focused on health care, senior living, nonprofit organizations and, as I moved down feeling very confident, I lost that confidence quickly. And it was about a year into moving here that I was let go. And so that was a shaping experience for me, having just bought a house here in Florida and living through that, looking back it was a fortuitous time for me in the way I was able to take advantage of that, but it was a really scary time, and so a very personal experience for me in the downturn. Ashley: I think your observation of a sleepy city is really acute. And the way you took advantage, you were amongst a sea of similar individuals nation-wide that went through similar experiences during that time, and the road map that you started to lay out irrespective of these challenges right at the gate. And I want to connect the dots to how you started to make inroads in a city that maybe wasn’t quite ready for you just yet. 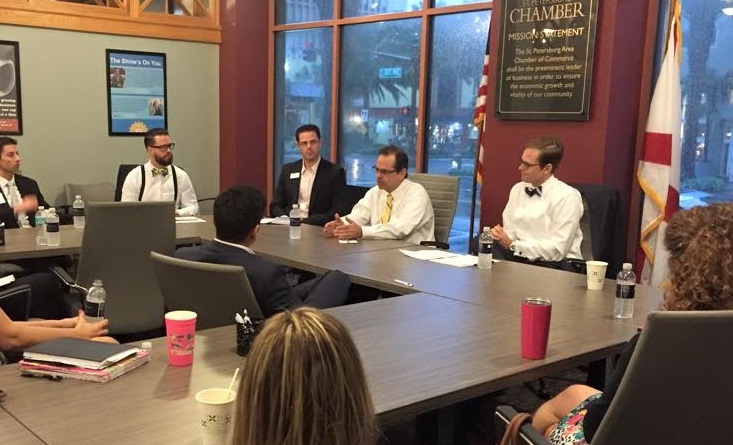 You talked about Leadership St. Pete earlier, but before that you were active in St. Pete Young Professionals as part of the Chamber prior to moving to Florida. How did that happen? Greg: When I was in Columbus, I think that I learned early on that I always wanted to leave things better than I found them, and so I’ve tried to be… I’ve had great examples along the way in that, and so even in Columbus I was involved in young professional programs and helped to launch some of those, and I knew coming to Florida that the Chamber, the Young Professionals programs were gonna be how I was gonna connect and plug in as a 20 something. So I did. I’m proud of having joined the Chamber before moving here, and being a part of Young Professionals was really what helped to get me connected. I made some of the closest friends that I have today, and in my first Chamber meeting I sat across table from Nathan Stonecipher who now owns and runs Green Bench, and Lucas DeVicente, and… Those early Young Professional days we were excited when we had 20 and 30 people at meetings that, of course, now ought to have 60, 70 or 100 people. I think the tie in is I was able to turn that tough period of losing my job ironically into an opportunity with Leadership St. Pete. And so when I had applied for Leadership St. Pete, I promise you that my company did not know this, but somehow they managed to let me go about two days before the check was due for Leadership St. Pete. So it was a really hard conversation to go tell Mollie that I just bought a house and I had this check for Leadership St. Pete that was due. And I was pretty sure that that was just a bad judgement call, to think about doing that program at a time where I had no income, I wasn’t sure how I was going to be able to write that check. And I give her a lot of credit, because she said, ‘There’s no way you’re not gonna do that and I’ll figure out a way to help however I can to get you there.’ And certainly I credit that moment as a lot of what set me on the path I am today, because Leadership St. Pete built a lot of the foundation for my involvement in the community, and built a lot of the relationships that I still cherish today and benefit from today in being connected. And I’ll tell you, as stressful as it was, my job search was meeting people. And so I may hold the record for having the most coffees with fellow class members since I’ve made that my full time job. 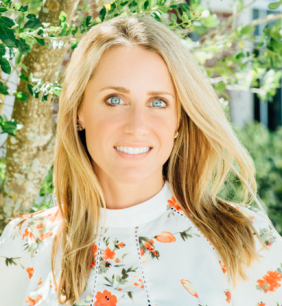 Ashley: And so for those who aren’t familiar with Leadership St. Pete, you’ve got a swath of– I don’t know where it was in 2009, currently it’s about 40 classmates. And you’ve got people that have recently moved to the area, people that are in-between positions, people that are well established in their careers and those that are just starting out. I would probably think of it as a sort of crash course in St. Pete, anything from understanding our history to getting involved in some major industries, from health care to government. What was your experience? Greg: I think everybody has their LSP story. And ideally for most people it goes beyond the year they went through the program. But you’re exactly right. I tell people that if you’re new to the community, it’s a great crash course in education in St. Pete and in community involvement, even if you’re not new to the community. The real value though, the lasting value are the relationships that you build. And when I look back on my class, it’s amazing– at the risk of leaving people out– David Jezek, who just yesterday made a huge announcement for a new middle school partnership with our school system– was in my class, it’s been a long-term relationship and getting to work with him on things. David Neely, who runs Chick-fil-A, has been a great community partner and come through on a lot of requests. I’ve had Frank Wells, who runs Venture House and is really involved in Midtown. Scott Wagman, who, the year following he ran for mayor has been a successful business owner, done amazing things at GreatX and otherwise, I’m soon to be joining the board of The Free Clinic where his wife runs the show. I just run through the litany of people. I still call Sergeant Borrelli– if I’ve got his rank wrong, he’s probably been promoted since then. And Mike Demonte with the fire department. And they bring out a cruiser and a fire truck for my neighborhood festival every year. Steve Kornell was in my class, who is now amazingly almost through his second term on City Council. And I’m leaving people out, but that’s the type of program it is. And when I think about the impact of that– and I didn’t even mention the planning committee, right? Of the people who are a bit more experienced and established in the community, but now Senator Jeff Brandes was recently back from Iraq guy working for the family business. And just really interesting the kind of relationships that you build in settings like that. Ashley: I see a correlation between that and your camp experience, because there is… It’s not an isolating effect, but you spend such concentrated periods of time together out of your work environment, certainly removed from civilization as you’ve once known it, really concentrated periods of time. And bonds are formed and new experiences are had and not ones that could happen without that insulation and that camaraderie that’s built through those shared experiences. Greg: Those are the words. You hit it on the nose, and I use the same words with people. It’s shared experience and it is very rare that you can get a group of people that’s that high performing to commit to spend that much time together. Ashley: Speaking of the Chamber, through several years you’ve worked yourself through the ranks and served on various committees in a leadership capacity, identified as member of the year in 2013. Ashley: And then you escalated into becoming the second youngest board chair in our city, and I would imagine that to be exhilarating on a couple of accounts, but also challenging in the sense that that could be perceived as maybe not a disadvantage, but just something that you’d have to keep in mind when navigating the politics and the evolution of our city. Talk to me about that experience. Greg: So I think that there are two things at play that allowed this opportunity for me, and I hope that my opportunity has allowed… opened the flood gates for us to continue to bring more young leadership in and more energy and new ideas. One of the things that gave me that opportunity is that St. Petersburg in general is just a very welcoming place, it is one of the hallmarks that we’re all trying to grab onto and harness and bottle. And maybe the beauty of it is that you can’t bottle it and it is fleeting, and so you really have to work to retain that. But it is such a welcoming community that I think anyone who shows up here and cares about other people and falls in love with this city like you and I have and all of your listeners have, I’m sure, right? Any of those people who show up and contribute will be accepted and rewarded for that. And I think likewise, the more you show up, the more you are accepted and recognized. And so I had gotten good advice and good mentorship, and said, ‘You know? In my late 20s, before I’m married, before I have kids, before my career is gonna hopefully get bigger and busier every year, I’m gonna show up everywhere and I’m gonna contribute, and I’m gonna say yes, I’m gonna take Bob Devin Jones’s advice and I’m just gonna say yes.’ And so, did I do too much? Absolutely. Was I stretched in? Sure. We’re all stretched in in that busy middle group. But making that commitment put me there enough that I became visible… And then I think the second piece of that was the transition at the Chamber, and that kind of hit the reset button. So there wasn’t necessarily an old guard, but even if there was, it really got retooled and rethought, and it gave us the chance to reinvent. And one of my favorite quotes from, ironically, from Michael Eisner’s biography, is that you can’t fall off the floor. And I think it was referencing him starting out in the mail room, working at Paramount, right? But when you start from ground level, you can’t mess it up too much. And there’s actually something empowering about that. And so being able to be part of the rebirth of the Chamber earned me a lot of credibility with the other board members. But ‘earned’ is the right word, because I showed up, and I’ve contributed, and I’ve put up in there a lot of long hours, and there were a lot of big asks, and I’ve never been afraid to think big or make a big ask. And so I think it was that confidence that gave me the shot. But it was really a lot of those leaders that were more senior than I am who were ready to give somebody a shot. And that’s what I’m most excited about, is that I think when you look at our Chamber board today, when you look at our city, we continue to be very welcoming of anybody who wants to show up, and continue to be a city that gets younger, and it continues to be embracing of youth and recognizing that people of all ages bring a lot of great ideas. Ashley: So during your time as board chair you’ve probably had a lot of major accomplishments that still resonate today, that we’re still actually benefiting from. And one of them was a benchmarking trip that originated in 2016 if I’m not mistaken, a trip to RDU, Raleigh-Durham, North Carolina. Talk to me about who went and the biggest learnings from that experience. Greg: So we talked about going to Durham and Raleigh, North Carolina, because Durham is often forgotten about little sister of Raleigh. And we picked it because it was this triangle area, and you have this cool little sibling in Durham to the big city Raleigh. And while St. Pete justifiably sits in the middle of the two of them, it was that interplay with the relationship that we have here with the triumvirate of St. Pete, Tampa and Clearwater. It was a trip that we started in 2016 and set it up in a way that it would become an annual tradition of thinking outside the Burg. And so much like Leadership St. Pete, we’ve built a good program and that we knew people would bring value away from, but it was as much about the relationships that you build after dinner drinks together with someone, as it was about the actual curriculum. So we certainly left there having seen some very interesting ideas. We went and looked at urban redevelopment, we looked at university partnerships, we looked at transportation, we looked at professional sports, so we did batting practice on a field of the Durham Bulls and we saw the redevelopment that led to a lot of the renaissance that’s happening in Durham today. The university partnerships, when we think about USF St. Pete here, when we think about St. Pete College, and Eckerd. And when we think about Johns’ Hopkins and the potential there for the future, a lot of what gets things done in Durham is Duke. When they go to build an office tower, often Duke will step up and guarantee enough of the building to get it out of the ground. And then they fill it up and kick Duke out and keep filling up, and then they go and do it over again. So those partnerships have been very strong and very self-fulfilling, so it was great for us to take our leadership team at the Chamber, at the city and in the business community go see that, and to hopefully bring some of that back. Ashley: I’m curious as to if there was anything that you arrived back to St. Pete that maybe begged for some attention. Greg: I think there were two things. I think it’s easy to be self-critical, and St. Pete probably lands on both sides of this, sometimes I think maybe we’re over-confident when we’re so proud of what we’ve done on Beach Drive and a couple of blocks of Central, and I get excited when I think about the next stage of that and where we can go with that. But I also think that sometimes it’s easy to be self-critical and so, it was eye-opening to go to Durham, that I think it’s caught a lot of great national press and national attention, much like St. Pete, and realize that they face a lot of the same challenges that we do. So there was some validation in seeing the education challenges they face. It’s an urban environment that didn’t have the gentrification or the redevelopment through the ’70s and ’80s that a lot of suburbs did, that Raleigh saw and that Tampa saw more of. And so there was some comfort in seeing those challenges. And then I think there was an ‘Ah-ha!’ moment when we heard from a very successful businessman who came out of the media industry and became a real estate developer by chance in the way he bought the Durham Bulls to move them out of Durham, and ended up getting blocked in doing that. And so he was actually forced into being part of Durham, but rather than fighting that, really embraced that. And the question that he inadvertently posed to our group was, ‘What is the next big thing?’ And he talked about that as one of his guiding principles in thinking about Durham, and in thinking about his business. And when you think about questions that we were left with, I think that was one of the questions. There are a lot of people doing a lot of great things in St. Pete, but what is the next big thing, or what are the next big things, but what are the things that we can all gather around and rally around? When I think about the next big thing, I believe that in the next ten years St. Pete is going to decide, and hopefully decide for ourselves rather than someone else labeling us… and I think St. Pete’s gonna determine whether we are a city or a suburb. And I think that the active path which I am on is to pump our EDC, our Economic Development Corporation, and certainly be a great regional partner, but own our identity as a city, as the fourth largest city in Florida. And I believe that if we work at it, that we will cement our position as the fourth largest city in Florida. And that’s what I wanna see, I think that makes us a better partner in the region and I think it makes us a stronger region. But I think that individual identity is great, and the analogy that the Chamber tends to lean back on is the mall, right? And a really successful mall has to advertise itself, because you want people to show up, but that doesn’t mean that you don’t want each store, and especially your anchor stores, to really brand and market their individual identity. Because when you show up to that store, you’re probably gonna make a trip to the food court and stop off at the Apple Store on the way, and who knows what else you might find as you’re moving along. Ashley: So 2016 was RDU, 2017– has that trip happened yet? Greg: It hasn’t. It should have if it weren’t for Hurricane Irma. This is a year of momentous dates. So we were supposed to be headed to Columbus, Ohio on September 11th, and had to make a difficult call a couple of days before that, that of course ended up in hindsight being a very easy decision as we look back on what took place. But we had to reschedule the trip, and so we are very excited now that we’re traveling to Columbus, Ohio on Columbus Day on October 9th, and eager to go and look at a lot of things in Columbus. Columbus is one of those cities that I think has not met the cool factor for a long time, and ironically because of that I think now is cool, right? Because it was so boring and mundane, the community there rallied and there’s a lot of similarities in their maker movement, in their neighborhoods, their arts and their corridor development. They benefit immensely from having some really big corporate partners. They certainly benefit from having a major research institution there. We’re gonna take a narrow focus on their downtown, right? So we’re gonna ignore the state capital part, we’re gonna ignore some of the big companies that aren’t in St. Pete, but look at the microcosm of their downtown, which has a lot of similarities to St. Pete. And we are in particular going to look at the success they’ve seen with soccer. So they were one of the first Major League Soccer teams… In fact, when I lived there they were very early in the Major League Soccer years and struggled to find their rhythm, struggled to have success there. Of course, the joke in Ohio is that in Columbus with the Blue Jackets and the Crew as their hockey and soccer teams, the only real pro-sports team of course is Ohio state, and that’s the team that everybody really pays attention to. So getting bandwidth in that room or in that area has been hard for MLS. But when you look at the trends in soccer as far as the ranking, with FIFA Soccer being the number one video game selling globally, and the attendance trends and the viewership trends of English premier league & international soccer, that are starting to flow down to U.S. soccer– it’s really exciting to see what they’ve done, and obviously we are very keenly interested in looking at what they’re doing as we are excited about the future for our Rowdies. Ashley: You were actively involved in that committee. Are you heading in that committee, or co-chair? Greg: I am. Tash Elwin, and I, Tash of Raymond James has been a great coach here with me, and that was going out as chair of the Chamber, that initiative flowed across the desk. I’ve actually been involved with the Rowdies since Andrew Nestor and David Laxer started the team playing over at Legends Field in Tampa out in the outfield of the baseball stadium. And it was a great coup for us to bring them here to Al Lang, and certainly Mr. Edwards has breathed a lot of new life and a lot of money into the team, and put a great product on the field. And so as that team developed, the opportunity for Major League Soccer developed a lot faster than anybody was expecting. And so we did launch a Rowdies council, and very proud that in about two weeks, in January of this year, we gathered about 250 letters from business owners pledging support, pledging sponsorship when the team gets announced, and made a real statement to Major League Soccer. And so we now sit as one of 12 teams being considered, and I would tell you that I think we sit very confidently in the top half of that. I think there will be two teams likely to be announced by the end of this year, and I think that we don’t expect to be in the top two, given some of the dynamics of the other teams, but we feel very good about our positioning and our chances for those second two slots that will be announced on not a specific schedule, but as– I think as things unfold, as Major League Soccer finds the next two teams to bring I think they’ll be making that announcement. So we don’t expect that announcement this year, but really excited about our chances for that as we look forward. Ashley: So, bringing Major League Soccer to St. Petersburg, it would definitely be just yet another feather in our cap and another good reason to live and play here. And you’ve been heavily involved in bringing the EDC, Economic Development Corporation, to St. Petersburg, and I know that you’re thinking about these things in terms of just that ultimate formula to create your vision of St. Pete being really the epicenter of this area, really a city. And talk to me about the evolution of the EDC, if you will. Greg: I think one of the exciting things about St. Petersburg and our EDC is that we’re taking a different approach to economic development and to recruitment and retention. So historically, EDCs are very oriented around landing the big fish. And those certainly make the splash, and those are often what people are compensated on in some settings. And I think we identified that St. Pete is a destination that a big company may very well be interested in, and we wanna be open to that conversation. But what we really wanna do is own who we are and communicate that story in an authentic way. So I do think that soccer is a great addition to the many amenities that we offer. I think soccer is a natural fit for our brand because it is so international. I will tell you that I walked into Locale Market for lunch a week or two ago, and on the bench sitting next to the door was Joe Cole. And people were walking past him not thinking a thing about it. And Joe Cole is a very humble guy and a genuinely nice guy, his kids are– he’s moved his family here, I think he’s really enjoying St. Petersburg. I will tell you that if you go to Europe, Joe Cole will get mobbed when he walks off of the airplane. And he is… Now, he played soccer in Europe, so he’s that well known, but the Rowdies brand is actually better known in European soccer parlance and communities than it is in the U.S. in many ways. So I think the idea of continuing along the lines of the Dali Museum, the Leadership Institute at Eckerd College, some of these institutions we have that really have international reach that bring people here from international locales, not to mention our beaches and the great things that tourism and Visit St. Pete/Clearwater do for us– building on that story and just continuing that story to say not only is this a great place to come visit, but it really is a great place to live and a great place to do business. And trying to authentically tell that story in a way that attracts people that are a good fit for our community, that solidifies for the people who have started businesses here or move businesses here that they made the right decision, and at the same time making sure that, as we’re doing that, we’re recruiting businesses and creating jobs that are going to present opportunities for those that live here. Because that’s a big part of St. Petersburg, is not just looking at the big shiny object in a new company and moving people here. We got a lot of people here and we want some more people here. We need to grow, but we need to grow… at the Chamber we talk about Grow Smarter, because we don’t wanna grow the fastest, we don’t wanna grow the biggest, but we wanna grow smarter and growth is good, but we wanna be smart and thoughtful about that growth, and we certainly don’t want to leave anybody behind. And right now in St. Petersburg, as you and I are talking, we’re still recovering from Irma. And that hurricane, even though we didn’t get a direct hit, had a much different impact on people who live in different parts of this community. So as we work forward, I think that’s part of the EDC, it’s trying to make sure that we have a rising tide that does lift all ships, and that we make sure we stay focused on that. Ashley: In the topic of Growing Smarter I wanna take it down to the individual level and growing smarter, especially as it pertains to active professionals in St. Petersburg. You referenced earlier really a fundamental part from the very get-go is just to show up and find different ways to get involved, to stay involved. And recently you got involved with the Free Clinic. Talk to me about your motivation to help out there. Greg: So… Yeah, I will wrap up my service on the Chamber board at the end of this year, and as I was thinking through where to turn my energy next, it really was looking at those in the community that have the greatest need. I was a Religion major in college, a little known fact about Greg Holden, and spent a lot of time in that, which– a Religion major may mean very different things to different people. For me it was pretty much that you’re left with more questions than you arrived with, and it was a very liberal arts based curriculum. But I loved the questions, and I studied liberation theology and feminist theology, and a lot of things that challenged what I thought I knew and what I was comfortable with. That concept of liberation theology, the idea that– in my faith tradition, right? That Christ was there with the least of them, right? And if you look at the examples of that, he was always trying to raise the quality of life or the experience of those people who were oppressed, or who were having the hardest situation. And so, when we think about each of us, think about the gifts we’ve been given… it’s been ultimately rewarding to be involved in the Chamber and I will continue to be involved there, but I do feel called to be a little more deliberate about trying to find ways to help those who can’t help themselves, or those who need some help to get themselves back on their feet. And I’m a big believer in organizations that empower other people to help themselves. There are certainly people… One of my first board opportunities here was with PARC, P-A-R-C, that serves people with developmental disabilities. It’s an easy organization to be involved in, because those people generally, and in many cases very smart and very creative, but often cannot help themselves the way that they need to to function in society. And so PARC provides venues for them to have a great quality of life and be contributors. And I think in a similar vein, the Free Clinic is really focused on people that are trying. It’s easy to blow off homeless people or people that are down on their luck as people that aren’t trying, and there certainly are some people out there that are working the system. The chronically homeless, there are some people who did okay being chronically homeless, but the vast majority of those people are not there because they wanna be there and they are looking for not a hand out, but a hand up. And I can’t think of a better organization, there are many good ones, but for me as far as Beth Houghton and what she’s done in this community, the opportunity to learn from her and help support her and work with her as the Free Clinic grows, it’s a fortuitous time I think to join them as they’ve had two major gifts and have been able to open a new facility Mid-county and their food bank that serves other organizations, as they’ve been able to open a new medical clinic that’s got better access on the bus line, and as they’re very eagerly looking at how they might better expand into and serve Midtown and South St. Petersburg. I’m really excited about being able to contribute there. Ashley: So, looking at your own personal motivations and how that informed your involvement with the Free Clinic, what advice would you give to other business leaders in the community who are looking for that next step in their own involvement, board and otherwise? Greg: So I think I’d share two things. A great friend, a great mentor early on told me that there are two types of people. There are people who wanna do and there are people who wanna be, and you can say that in a lot of ways and I think that’s true with a lot of things in life… it’s true in a work setting, it’s true in a community setting. And I think it’s worth all of us reflecting on that. Because it’s easy to sign up for things and then not show up. And it’s easy to do that, because you need to check the box, to have some community involvement, and obviously that’s not great for either the community or the person, right? If you’re showing up to be, you’re probably not in the right place and you’re probably taking the place of someone who wants to be doing. And so I’ve always tried to focus my energy on things that I know I’ve got enough passion for, and then I can see the path forward where I can have an impact and where I can be a doer. And when that stage of doing is done for me, then it’s time to move on and figure out what the next piece of doing is. There’s very much feeling that I’ve been fortunate, I’ve been given a lot of opportunity, and I feel a debt, that I owe it to those that have paved the path for me to give that back. And I think that the other advice I would give or the other theme that has sustained me and really helped as I’ve been involved in things and wanted to be involved in more things and different things is that momentum, it is the idea of saying yes to a lot of things when you start out, and being present and contributing, but that idea of building some personal momentum means that when you are out and about and leading some things and following some things, you’re gonna be a part of conversations that build on each other. They’re gonna make you a better leader, the conversations you’ll have, if you’re doing it right, will help regardless of what your profession is and what job you’re in. But that momentum in life I think is so important, it’s hard to start anything from a standstill. And so that was why for me it didn’t really much matter what I got involved in, right? To get into Leadership St. Pete I had to have some traction, right? So for me that was my neighborhood association. And as trivial as that might seem, it was a lot of fun and it really taught me early on that what life is really all about is bringing people together. You can get in any association and everybody can get upset about this trash pickup over here, this overgrown lawn over here, and those are issues you need to tackle. But what people really wanna do is drink wine on their front porch, right? And so that stuck with me, but that neighborhood opportunity lend itself to me, raising my hand and being part of the council of neighbor associations. And yeah, just building that momentum of being involved in organizations, especially in a community like St. Pete where it’s a big small town, or it’s a small big town, gives you the relationships that over time help you to sustain that momentum. And then later on you may not be able to say yes to everything when you are married and have a two-year-old running around, but it gives you that base of relationships and community knowledge to be more effective in the things that you’re more selectively participating in. Ashley: Appreciate your time here today. Greg: Ashley, it’s been my pleasure.